Raymond “Carlyle” Blanton was born om April 21st, 1925, in Richmond, Virginia. Living there with his parents, he had 7 siblings. He was very close with his youngest sister Shirley. Carlyle had a happy smile, a twinkle in his eye and a selfless spirit. He had a girlfriend with whom he rode horses. She was a member of The Catholic Church, and although he wasn’t, he went to church with her for over a year and converted to her religion while on the ship on his way to Europe. He planned to marry her in St. Benedicts Catholic Church when he returned, but this was not to be. Carlyle also discovered a musical part in him: His mother taught him to play piano, and he was quite talented at it. He also had a very mischievous streak, always playing tricks on others in the family. Times have been hard during that period in the US, and Carlyle also did his share to help the family in difficult times. Carlyle dropped out of school at 16 years of age to help to support his family. He worked as an Oil Man, changing oil in military vehicles at the location of the Virginia Militia headquarters for 18 months before he joined the Militia.He gave all the money he earned in the VA Militia to his parents before being drafted at 18, excepting some change for his little sister, Shirley, whom he was very close with.The work at the militia was the precursor to the Virginia National Guard. 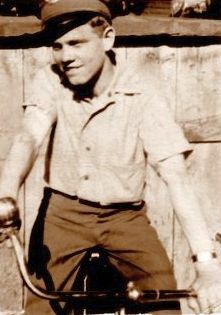 He used to ride his bicycle to work, as can be seen on this picture where Carlyle was only 14 years old. During the war, Carlyle told his mother about some of the guys trying to dodge the military draft by putting soap under their arms to elevate blood pressure, and with this, hoping to fail the tests. Carlyle didn’t want to do any of this, and told his family he was proud to go and serve his country. He was drafted in August 1943, and trained with the 232rd Infantry Regiment of the 42nd “Rainbow” Infantry Division at Camp Gruber in Oklahoma. Carlyle can be seen wearing the Rainbow Division Patch on his dress uniform on the photograph at the top. He earned a sharpshooter badge here, and was promoted to Staff Sergeant, and left the camp on August 4th, 1944. Missing in Action in the Hurtgen Forest. Carlyle was then reassigned as a replacement for the 60th Infantry Regiment in the 9th Infantry Division, 1st battalion, C Company. He arrived in England late August or early September. From there he fought in France, Belgium and Germany. It was during one of the battles in the Hurtgen Forest in Germany, that Carlyle was declared “Missing in Action” on the morning of October 14th, 1944. The 60th Infantry Regiment was charged with the Germany Campaign beginning on September 15th, 1944. By the beginning of October 1944, the 60th Infantry Regiment was in a defensive position in the Hurtgen Forest, situated near Aachen and the Siegfried Line near the Belgium and German border. The Infantrymen held their positions and captured enemy territory. However, strong attacks persisted near the Raffelsbrand Junction. On October 12th, 1944, the 1st Battalion captured two pillboxes (above ground bunkers), and moved their lines forward. Staff Sergeant Blanton and the men of C Company attempted to take more enemy pillboxes but were met with very heavy resistance. On October 14th, 1944, Staff Sergeant Blanton and thirty-tree men from C Company were declared “Missing in Action” during this brutal fighting in the Hurtgen Forest. “Well mom, that’s about all for the time, but will write again soon and you do the same. P.S. Mom, don’t worry about me, I am O.K. – Love to all, Carlyle”. The letter was dated October 5th, 1944, just one week before Carlyle went missing in action. The American Graves Registration Command of the European Zone investigated the area, and all missing men but four, were recovered. Raymond Carlyle Blanton’s remains were among the four that were not recovered, and he was declared Killed in Action on October 15th 1945. His remains were then declared “non recoverable” on December 20th, 1951. 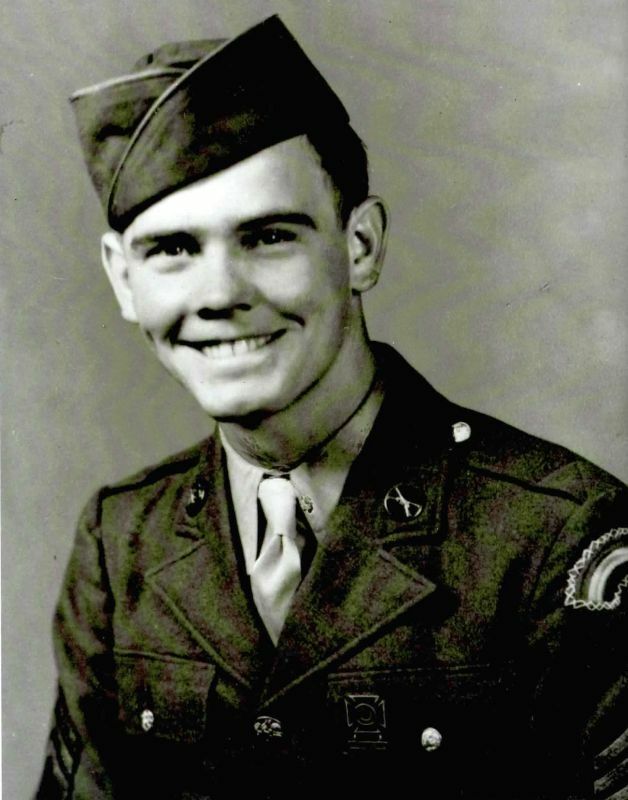 Carlyle was awarded the Bronze Star and Purple-Heart, and memorialized on the “Wall of Missing” at the US Cemetery in Margraten, The Netherlands. Raymond C. Blanton’s name on the Wall of Missing at the US Cemetery in Margraten, The Netherlands. Several years ago, I got in touch with the niece of Carlyle, Mrs. Nancy Fraker. This wonderful woman is very dedicated in finding the remains of her beloved uncle. She has done some great research and provided me all the information on this page. Several remains found in the same area where Carlyle went missing could never be identified, and these have been buried in several graves as an “Unknown Soldier”. It might be possible that one of these unidentified soldiers is Carlyle. Research on this is still ongoing, now also with the help of the wonderful people from www.stichting-mia.nl. Visiting the area where Carlyle and the other men of the 60th Infantry Regiment fought so hard during those October days in 1944, traces of battle are still visible. Even though the Hurtgen Forest is a peaceful area these days, it still feels very eerie to walk around there. The 9th Infantry Division lost thousands of men here. Many foxholes and craters can still be found. Parts of the bunkers that kept the men of the 9th Infantry Division from advancing are now silent witnesses to the terrible fights there. A few years ago, the name ID tags, called “dog tags” of another soldier, Walter Reuter Jr. of Company C, 60th Infantry Regiment were found in the same area where Carlyle was last seen alive. At the spot where the dog tags were found, remains of the old bunkers nearby were used to make an improvised memorial. During one of my visits I brought a picture of Carlyle and one Walter with me, wrapped in plastic, and placed it on the memorial made out of rocks. We placed some flowers as well. Months later, someone we don’t know, made an iron cross made out of old poles used for barbed wire defenses during the war in the area. Slowly the monument was growing. Again later, my pictures were framed by someone, and pieces of shrapnel and other things found in the area were added. It is simply wonderful to see the monument growing. It is a sign that these men have not been forgotten. Personally I still have high hopes that one day we will find Carlyle. Some items found in the area where Carlyle went missing. Parts of a M1 ammo clip and a M1936 suspenders or musette bag hook. Touchable pieces of history. The different stages of the always growing memorial for Raymond Blanton and Walter Reuter Jr. The story and picture of Carlyle made a very big impression on me. Ever since I heard about him, saw his name on the Wall of Missing at the US Cemetery in Margraten, and visited the area where he was last alive, I felt that I needed to do something special to make sure these men would never be forgotten. It resulted in the idea to write a book about the events of the 9th Infantry Division in the Hurtgen Forest. I feel strongly connected to this young man, who left everything behind to fight for our freedom, and he is one of my biggest inspirations in life. He surely will never be forgotten.